"My tour with Ecocourageous was inspiring, connecting, and magical. So grateful for Joshua's vision of connecting people to this beautiful planet we call home. His wisdom and playfulness, with a balance of structure and flow offered myself and the other participants a hands-on experience with our most precious resource--water. I highly recommend the Watershed Witness tours as well as any event that educates and integrates us into more relationship with ourselves, each other, and our planet." ~ Rebecca Farrar, M.A. We first toured these watersheds in Summer 2015, witnessing our reservoirs at the bottom of a five year drought. Since then we've swept through three of the officially wettest winters on record in California. As of Spring Equinox 2019 we are officially OUT OF THE DROUGHT (for now)! It has been a deeply dramatic number of years. Reservoirs overflowed. Dams and hatcheries were overwhelmed, the Tuolumne spillway opened for the first time in twenty years, and Lake Berryessa's glory hole started sucking again for the first time in a decade. 24 California counties received disaster declarations -- but overall Bay Area infrastructure held. Before the rains stopped, EBMUD, the water supplier for the East Bay reassured their customers "not another drop needed." This means extra water was lost, returned to the ocean -- revealing our lingering need to learn how to make the most of our rainfalls, to change California's short-sighted and imbalanced historic relationship with groundwater and water rights. Much more challenging records were broken in 2017. The overwhelming winter rains spurred abundant spring green growth, followed by the hottest summer in recorded California history, leading directly to the deadliest and most destructive fall fire season so far. 2017 also found vivid witnessing of the struggles of water protectors around the world -- in the solidarities born at the Standing Rock Sioux Reservation in North Dakota, and the anniversary of Berta Caceres's assassination for protecting the Aguan River in Honduras. In 2015 we lost over 200 environmental activists killed around the world. Do you know who's protecting your water? Closer to home, there are Bay Area Ohlone indigenous initiatives we can support this season, and near at hand challenges of climate justice, including East Bay sacrifice zones, and Californian's access to clean water, to educate each other and get involved around together. This Watershed Witness Tour offers the possibility of embedding ourselves within these stories, and passes along a portion of the proceeds from each tour to support local and global watershed protection. This year we'll again be supporting the Winnemem Wintu Salmon Run, tracing by foot, horse, bike, and boat, the route our Salmon family return to their birth homes on the McCloud River. Katherine Evatt of the Foothills Conversancy, which has protected the Mokelumne watershed for the past 30 years, has just completed a campaign to encourage the California Natural Resources Agency to declare 37 miles of the Mokelumne (between the reservoirs we visit on our Watershed Witness Tours) part of it's protected California Wild and Scenic Rivers System. The proposal has received thousands of comments and looks likely to pass. Katherine has generously offered to meet up with our next tour group to discuss the history and ongoing protection of the Moke. Winter 2018 in NorCal was all over the place -- warm bud-blossoming weeks interspersed with unexpected frosts. February tracked close to the driest year on record '76-'77, then a wetter "March Miracle" precipitated by several atmospheric rivers passing along precipitation from the Pacific doubled the amount of Sierra snowpack. As of Spring Equinox 2018 Pardee Reservoir was at 92 percent of capacity; Hetch Hetchy Reservoir in Yosemite National Park was at 80 percent. Then April's Pineapple Expresses of warm waters from Hawaii forced the closure of Yosemite Valley for flooding, in one storm sadly killed 90% of the fish at Mocassin Creek Hatchery when the Mocassin Dam downstream from Hetch Hetchy overflowed. We received record rains to fill the reservoirs and snowpack to slowly drain into the aquifers and water tables, allowing us to celebrate our exit from the drought. Whether or not decades-long megadroughts disappear from the horizon, remains to be seen. Snow will likely still blanket the higher elevations, and waterfalls will likely be still pouring from early spring's rains, but we'll see together, and hopefully get to splash and splosh in person. While our relationship with climate continues to change rapidly -- and the likelihood of drought lingers over the coming decades, today these rivers still support our homes. HETCH HETCHY is one of the most intensely argued over valleys in the western United States. Carved out by massive glaciers, shared for thousands of years by Paiute and Miwok indigenous communities, it was considered protected until the 1906 San Francisco earthquake, and over the objections of original environmentalist John Muir, the city secured the rights to dam this gorgeous basin. Starting our tour in the city of SAN FRANCISCO, we may discover abandoned gold rush shipwrecks over which the financial district now towers. We may visit a tidal wave organ, the ruins of a popular oceanside bath-house, architectural nods to walrus massacres that funded SF, or a mural that depicts the Venetian canals of future Mission Street . If there are underground cisterns near your neighborhood, or a spot to bear witness to what waters flow near your home, we'll begin our morning exploring these together. Next, we'll journey about 45 mins south to the PULGAS WATER TEMPLE built in the 1930s, where the Hetch Hetchy Aqueduct from the Sierra Mountain reservoir (160 miles away within Yosemite National Park) terminates and San Francisco's drinking water arrives in the Bay Area. After lunch we'll travel to the Moccasin Powerhouse and Fish Hatchery at the top of the DON PEDRO RESERVOIR, the largest reservoir on the Tuolumne River, and the beginning of the Aqueduct's gravity fed journey downhill all the way back to the Pulgas Water Temple. The Mocassin Dam almost collapsed during the late winter rains of March 2018, and over 90% of the fish at the hatchery perished in one storm's overflow of the river. After cooling off, it's another half hour to OUR CAMP up at 4,422 ft, nestled along the banks of the Middle Fork of the Tuolumne. Offering fresh organic farmer's market sourced food and stories around the campfire, as well as night photography by the river, warm breakfast in the morning, as well as solo time with the river. Campsite has water and basic toilet. We encourage our tour members to bring everything you need to have a successful camping experience, which we will go over in detail before hand, and can provide extras as needed. Then, for those staying another evening for the full eco-educational immersion -- we'll have music and creative time back at camp, with opportunities the next morning to enter YOSEMITE NATIONAL PARK once again and (if the Tioga Pass is open) either tour the High Sierra, including potentially five Tuolumne River waterfalls, and visit Tuolumne Meadows at 8,600 feet where the river confluences a few miles below it's very source at 8,589 ft, springs spilling from the highest peak in the park, Mt. Lyell ~ or (if Tioga Pass is closed from snow, which it likely will be for our first Spring 2019 journey) explore Yosemite Valley where tributary waterfalls plunge hundreds of feet to the stunning valley floor. 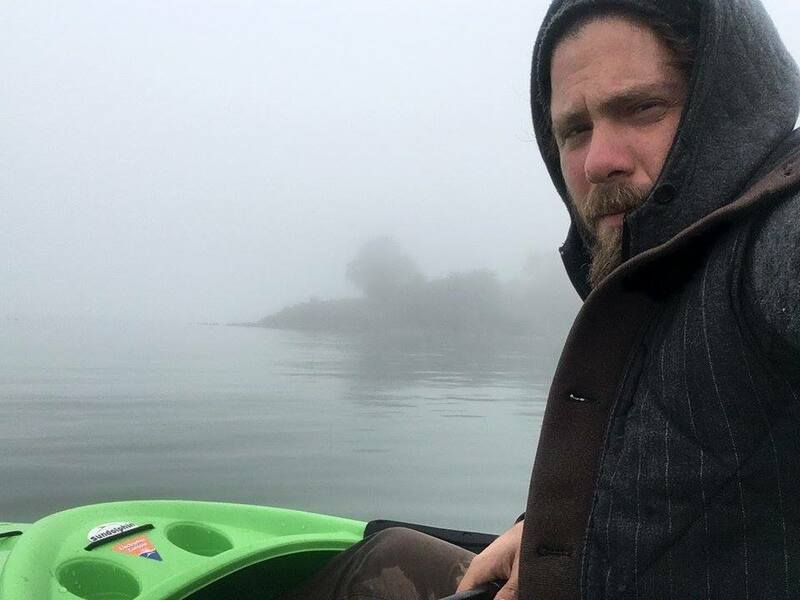 Joshua Halpern will be our eco-immersion guide. Josh brings to these adventures an MA in Integral Ecology, a BFA in Film, a Wilderness First Aid Certificate from Foster Calm, over a decade guiding adults around the world in reconnecting relationships with their local ecologies, five years working in outdoor education with children, and a lifetime exploring the river systems around his home. He was born at the confluence of the Matawan and the Wopowog rivers in central New Jersey.